Heat pumps are an excellent way to supplement heat in the milder heating season. Heat pump uses same system as air conditioning but in reverse. It takes the heat out of refrigerant to warm the house. In New York and New Jersey a heat pump can be used all year with exception of the coldest winter months. A heat pump is only efficient at extracting heat from refrigerant in outdoor temperatures above freezing. Below 32 degrees Fahrenheit a heat pump becomes inefficient way to heat a home and must be supplemented with a more traditional heat source. Heat pump heat output can only be of same amount of BTU as existing AC. In other words if your home has a 3 ton (36,000 btu) ac, it would have a 36,ooo btu heat output. Heat pump uses electricity, which is significantly cheaper than gas heat and oil. 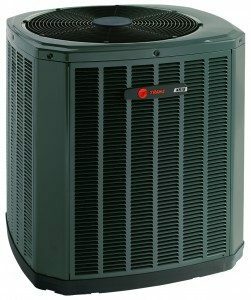 Trane heat pumps are among the best on the market and we are proud to be dealers of Trane Heat pumps. If you would like to find out more information about Trane products please give us a call or contact us today.